Oh yes!!!!!!! If you're anything like me, you're always looking for a way to earn FREEBIES with those coupons from the Sunday paper. One of the hottest coupons in the inserts from last week is scoring us FREE razors at Walmart and Kroger! Be sure to grab lots of the $3 off Bic Razor coupons from the July 27th Smart Source insert. 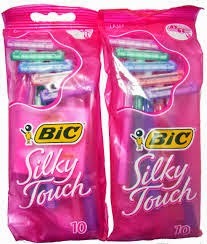 Walmart has the Bic Silky Touch Razors for $2.98 and Kroger has them for $2.79. So, at both places, you can snag the Bic Silky Touch Razor 10-pack for FREE!